Colleen Conway-Welch is Professor and Dean at the Vanderbilt University School of Nursing in Nashville, Tennessee. She received her BSN from Georgetown, her MSN from Catholic University in Washington, DC and her Ph.D. in Nursing from New York University. She has received three honorary doctorates [D. Hum of Humane Letters (honoris causa)] from Cumberland University in Tennessee, Georgetown University and the University of Colorado and the NYU 1999 School of Nursing Distinguished Alumni Award. She completed her nurse-midwifery education at the Catholic Maternity Institute in Santa Fe, New Mexico. 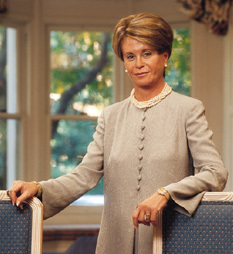 In her professional role, she served on Governor Don Sundquist's Commission on the Future of TennCare (2000), the National Bipartisan Commission on the Future of Medicare (1998-1999), is a member of the Institute of Medicine of the National Academy of Science (1997-), the Advisory Committee of the Robert Wood Johnson Foundation (1999-), the Advisory Council of the Agency for Health Care Policy and Research (1997-2001), the Board of Directors of Funding First, a Lasker Foundation initiative to advance the recognition of the contribution of biomedical research to the health of the public (1992-), Tennessee State Board of Nursing (1986-1991); reappointed (1991-1996), the Tennessee Citizens' TennCare Review Commission, (1995-1998), External Advisory Committee to NIH on the Clinical Center Committee on Workforce Projections (1996-1999), DHHS Office of Technology Assessment (1994-1995), Pew Commission Managed Care Education Project (1994-1995), Committee on Substance Abuse and Mental Health Issues in Aids, National Academy of Science, Institute of Medicine (1993-1994), President, Friends of the National Institute for Nursing Research, NIH (1997-1998, 1998-1999), Board of Governors, Healthcare Leadership Council (1990-1994); reappointed (1994-1997, 1997-2001), National Advisory Council on Nursing Research, NIH National Center for Nursing Research (1989-1993), and President Reagan's Commission on the HIV Epidemic (1987-1988). She is also a Member, National Trustees National Symphony Orchestra in Washington, DC (1999-), Member, Visiting Committee, University of Michigan School of Nursing (1995-1998), Fellow, American College of Nurse-Midwives, (1995-), Recipient, Jack Dempsey Award for Humanitarianism at the 7th Annual Helen Hayes Community Award Dinner, St. Clare's Hospital, New York City, (1989), Fellow, American Academy of Nursing (1980-), and Member, Sigma Theta Tau International Nursing Honor Society, (1968-). In her community role, she chairs the Middle Tennessee United Way Annual Campaign (1999), she chaired the Board of Directors of the Nashville Symphony (1996-1997), the Nashville Chamber of Commerce Report Card Committee on Metro Schools (1994-1995), and the Nashville Rotary Foundation Allocation Committee (1993-1998). She is a member of the Board Advisory Committee Hospital Hospitality House, Nashville Humane Association (1996-), Advisory Committee, Nashville Metropolitan Development and Housing Agency (1995-1997), Advisory Board, Alive Hospice of Nashville (1994-), Advisory Board, Women's Fund of the Nashville Community Foundation (1994-), Board of Directors, Junior Achievement Middle Tennessee (1993-1996), Board of Directors, Nashville Health Management Foundation/Comprehensive (Aids) Care Center (1993-), and Metropolitan Davidson County Mayor's Commission on Aids (1992-1993). Her corporate memberships include Board of Directors, First Union Bank of Tennessee (1994-1999), Board of Directors, Diversicare, Inc. (1992-1995) which split into Advocate and American Home Patient, Board of Directors, American Physicians' Network, a management services organization for specialty physicians (1995-) and Atopix Pharmaceutical Corp. (1996-1997). Her foundation activities include membership on the Board of Directors of the National Fund for Medical Education (1995-) and she is the Vice President of the Board of Directors of the Godchaux Brothers Foundation (1995-). much more than nursing and the degree is not a cv builder. I believe a master's (like VUSN's Health Systems Mgmt major) is excellent for nurses who are interested in getting a masters and are at an age where a CNEF position of a large system is in the distant future and who, in the future, will anticipate needing additonal education in finance as they move into those top positions. I think the combination of the MSN/MBA is desirable for a nurse who wants to move into the COO or CEO position. (The MBA would be a natural to add to VUSN's MSN in Health Systems MGMT. ) I also believe it is helpful for a nurse to have a master's in nursing before s/he adds the MBA because her/his expertise in advanced practice nursing needs to be respected by the troops in the trenches. Answer 3 - Bonnie is our Assoc dean for practice--Bonnie, do you have any thoughts to add? Paul Miles had several PNPs in his office practice, who were in a team with the pediatricians in Magic Valley. Eddie Hamilton here in Nashville uses PNPs also in his peds practice. Green Hills has Jane Case in adult primary care. All of these models exist, but formal measurement of cost/quality outcomes is often not done.